Last month’s Daredevil #1 proved to be a hard act to follow. For me, Daredevil #2 wasn’t quite the phenomenal read we saw last month, but it’s still a very strong issue that I have mostly good things to say about. Let me first just tell you about some reservations I’ve had about the long list of villains that both interviews and solicits have informed us will be appearing in Daredevil. It’s not that they’re not inspired choices – and I never doubted that they could be the focal point of some really interesting stories – it was the sheer number of them that made me wonder how exactly each issue was supposed to lead into the next one when each villain encounter appeared to be over and done with in one issue. I knew we weren’t looking at a return to the done-in-one stories of the past, so how exactly would Mark Waid find a way to string seemingly disparate elements into a naturally progressing series of events? Suffice it to say that I must have been dense because Waid pulls this off like it’s a no-brainer. Here we learn how next issue’s star villain enters the picture and how his doing so connects us to the events of last issue. It feels organic, and where the choice of villain is somewhat surprising, the creative team plays off of that by having Daredevil share in the readers’ confusion (and not only because his senses are faced with a formidable challenge). For me, the weakest scene was actually the first one. Yes, the big fight scene with Captain America – though it looks great and is wonderfully choreographed – seemed the most inconsequential. I have no doubt that Mark Waid plans to get back to the issues raised during the two heroes’s confrontation, and the scene does provide a good opportunity to introduce more of Matt’s recent history to potential newcomers, but Cap’s appearance seems just a bit too much like a marketing opportunity for Cap (I did see his movie and it was great), than an important addition to the overall story arc. And, while the scene is very beginner-friendly in some aspects, I personally had the rare experience of not quite knowing what was going on. I read about seven Marvel books per month and visit sites like CBR daily, but I’ll admit that I had no idea that Bucky had been on trial for treason and I’m not sure why those references were absolutely necessary. It made made me feel that I may have missed some of the emotional impact of the scene. 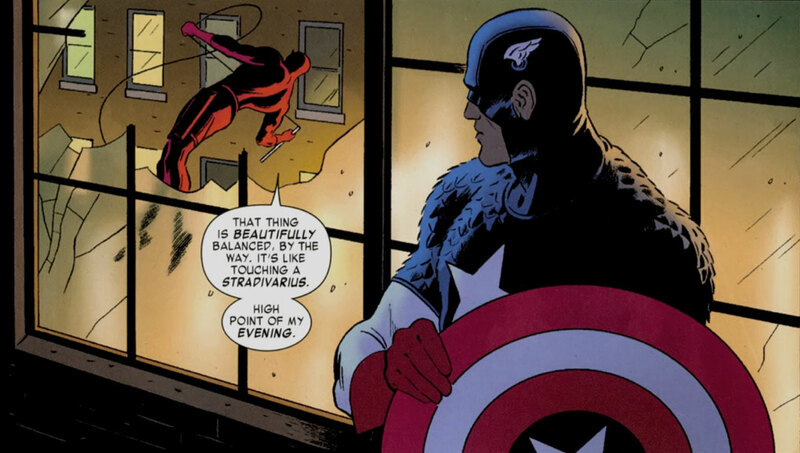 On a positive note, the Cap encounter had some great moments, such as the one above in which Daredevil compares Captain America’s shield to a violin. The next scene is just two pages, but very strong and thoroughly enjoyable. After speaking with Matt, new assistant D.A. Kirstin McDuffie pops in to talk to Foggy and drop some hints about their case. This new character is really starting to grow on me and the dialogue is fun with lots of innuendo. And, kudos to the creative team for actually featuring Mike Murdock’s hat and sunglasses (check out the panel below, on the far right)! And I know for a fact that I’m not imagining things since I had it confirmed by a trusted source. Hilarious! Based on the new information, Daredevil goes out to investigate why some of his colleagues around town have been backing away from representing Jobrani, whom we met last issue. This chase takes him to the New York High Line, in what is just one of many concrete examples from this issue and the one before of the entire city playing an active role in the book (careful readers will also have noted that the law office has moved uptown to Hamilton Heights). 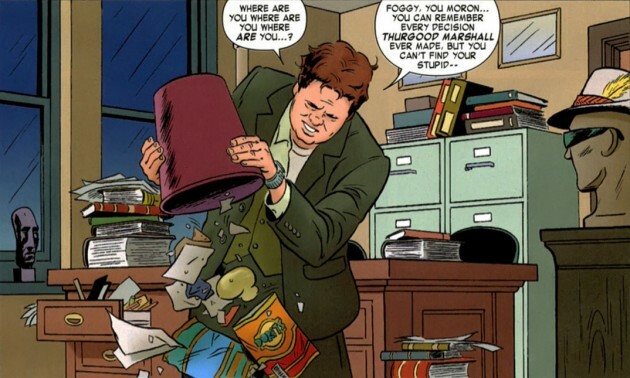 In attorney Gene Loren, whom Matt – as Daredevil – meets during his investigation, we also have an example of a gay man and his boyfriend being portrayed just like any other heterosexual couple. This isn’t something I should have to feel compelled to point out, but it’s still a rare thing to see and I very much enjoyed the way this scene was handled. This takes us to the final scene of the issue, and the creative team once again show off their knack for making would-be silly villains super creepy. Matt comes up against a threat he can’t make sense of and the obvious confusion and even fear he feels is clearly conveyed to the reader. Yes, Klaw is scary as hell and we’re left with both a cliff-hanger and larger mystery to ponder. Minor qualms aside, there’s an elegance to both the art and writing that makes the storytelling both efficient and rich in information. I hate it when a comic takes less than a few minutes to read because the script is full of filler and there’s nothing in the art to grab your attention. This isn’t a concern here, the art is expressive and has just the right level of detail and the pacing is really good. I’m definitely looking forward to next issue and am glad that we’ll be seeing two issues of Daredevil next month. In other good news, I got my computer back from the repair shop early. This has nothing to do with Daredevil per se, but it sure made this review a joy to write. What did you think of Daredevil #2? Let us know in the comment section! Bucky did some terrible things while he was mind-controlled, a fact that Steve Rogers brought up and defended him against in Bucky’s trail. Daredevil brings that case up, like any good lawyer, to see that their situations are similar. I had a good laugh over the Mike Murdock knod! Glad I wasn’t the only person to spot it. I thought the issue was great. Waid is a solid writer and I think the series is only going to get better. Really looking forward to where Waid and company will take us! The Stradivarius line made my night. I am totally clueless as to whats going on in the rest of Marvel other than X-Factor, but Waid wrote it in such a simple and straightforward way you really didn’t need to have read the Bucky story to get the full gist. Had faith that Waid wouldn’t have Matt and Cap get into a full-on knock down. Thought maybe Matt would just say the name “Wolverine” and Cap would be like “yeah sorry Matt, we’re all being hypocrites. Hey wanna be an Avenger?” But I guess that would have been too on the nose. Love, love, love the artwork. Oh, and Foggy’s Lucky Tie… Now I’m seeing the fact that Kirstin seemed none too impressed by Matt in the previous issue under a whole new light! First–I’ve just discovered this blog, and it’s going to the top of my read list. Thank you for writing it! Daredevil has been my favorite hero since I was 12 years old, and in all that time I have been the only Daredevil fan I know. It’s wonderful to find an outpost of my tribe! Thank you again for creating this wonderful site! Completely missed the Mike Murdock hat and glasses. Classic! Thank you for pointing it out. I thought the Cap encounter was a bit forced (like most hero to hero fights) but it was fun to watch. Brief but fun. The next page could have said, “Hey Matt, thanks for noticing how great my shield is, fighting with you cub is like banging a rusty cow bell.” JK. If I have one complaint, it was the massive amount of house ads. I’m starting to think Marvel wants me to read fear itself or something. First off, I hope they keep the Daily Bugle fill-in/reminder page. It’s fun to read plus it keeps with the notion of how the media won’t let go of the idea of Matt being DD. But how Matt defused the situation was what impressed me the most, by showing the clear connection, as well as respect, both characters have to each other. Another terrific issue with a cool cliffhanger. Bring on Klaw! Like RM Hendershot, I am also new to this site and from what I have seen so far it is terrific. I pretty much agree with the general consensus on #2 on the use of Cap coming after DD, the Stradivarius line, Foggy’s missing tie and the artwork. The whole direction is very satisfying since I was not much of a fan of the Shadowland or Reborn storylines. I certainly enjoy a good dark & gritty story, but they just didn’t hold up for me. I also want to highly (very highly) recommend Ed Brubaker’s Winter Soldier storyline in Captain America. I was skeptical of bringing back Bucky, but it has been fantastic. And as a bonus – a healthy dose of the Black Widow.